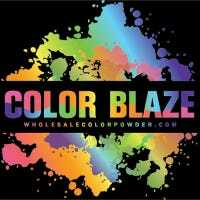 Color Blaze provides enjoyable entertainment to organizers of fundraising events, color fun runs, color wars, color powder explosion, and all vibrant activities! We provide wholesale color powder in individual packages and bulk color powder sales for both small and big needs and events. Promoting a color fun run is one of the most important aspects to making it a fundraising success. If the community is not EXCITED about attending and joining the color fun run fundraiser for your cause, it doesn’t matter how much color powder you have, or how great the prizes are. Photo Booths (also known as Selfie Stations) are hands down a favorite activity at Gender Reveal parties. Because they loosen everyone up and create instant keepsakes, they are one of best gender reveal party ideas. Kids covered from head to toe in colored powder with smiles a mile wide paints a pretty enticing picture for school fundraising! Rainbow runs are great fundraising vehicles because a fun run where you get to get messy gets people involved! If you are organizing your fist Color Fun Run you may be wondering just how do you get all that vibrant colors on your runners? First you need to understand the basics of how a fun run is set up. Maybe you’re wondering just what is a color run?